I don’t think I have ever ranted on my blog. Those of you who know me know that it takes a lot to upset me. I really try to roll with whatever is thrown my way (it is what it is) and keep a cheery disposition. But after another frustrating experience with a certain airline, I needed to express my dissatisfaction. I travel for business, and like most business travellers, we are pros at getting out the door for a trip in short order. I can pack a bag for a 3 day trip in 10 minutes, breeze through security withoutever setting off the alarms (this does not include getting pulled out of line for hand-swabbing or pat downs – really, do I look like an evil-doer? ), and have all required documents at the ready. I really enjoy travelling for work, that was one of the requirements that drew me to my current position. I love meeting like-minded people, talking tech, and getting out from behind the desk. The part I hate about travelling is the flying part. I would rather drive the 5 hours to Ottawa (even with 50 14-year-olds as I did with my daughter’s grade 8 trip last year) than jump on a plane for 60 minutes. 5 years ago when I flew quite often, I learned very quickly which airline I preferred of the 2 main choices here in Canada. I wrote this blog post as I sat on a flight following yet another frustrating check-in, and I promise myself I will never fly with this airline again. I understand delays, hiccups, bad weather, late-arriving luggage; that’s the nature of the beast, but this is the last time I will have this airline make my trip miserable and cause me to be delayed. Back in January, I had to book return flights from Toronto to Montreal (about 500 km), and I choose this airline because of the timing. I have done this flight several times before, and I know from experience that this is normally a 45 minute flight. Long story short: what should have been a 4 hour trip door-to-door was 9 hours. I could have driven to Montreal, had dinner, and still had 2 hours to kill in the same amount of time. The return trip was better, but not by much, as we were delayed again. Did we receive any compensation? No. Anything? No. I booked my most recent flight from Calgary to Toronto with this particular airline, again, because of the timing. I was supposed to have a full work day and this flight had the best time for me to leave and arrive home after being away from the kids and the dog for a few days. Between the bad jokes and tight seats, I normally only fly this airline as my second/last choice. On this trip, I booked with my preferred airline, but the final leg was booked on my second choice. This airline changed their cut off check-in times to 45 minutes prior to departure. I agreed to this as part of the ticket purchase, but really didn’t give it a second thought, as I have never missed a flight due to tardiness. A few hours prior to departing, I planned to check-in online but while I was trying to tie up lose ends before the end of the business day, my laptop crashed; I ended up never checking in online. I arrived at the airport prior to the 45 minute cut off, but by the time I arrived to the departures terminal, I was 4 minutes past the 45 minute check-in. I explained the situation to the kiosk rep and was told I needed to speak to another rep, but it shouldn’t be any issue as I was only a few minutes late and didn’t have any baggage. She directed me to the customer service line, saying the line was moving quickly. Apparently, there is a difference between the meaning of “moving quickly” in Ontario and Alberta. There was nothing fast about that line. By the time I finally spoke to the rep, I had about 20 minutes to get to my gate. She called down to the gate and I was told I couldn’t get on the flight as boarding had already started. And we all know, boarding is a very fast process. If I walked into the terminal at that moment with a boarding pass, I would have made the flight, but the service rep was not being overly accommodating. My choices at this time were already limited as I had to be home that evening, so I had to pay the $50 to get on the next flight. The company motto is “[insert company name here] cares”. Really? I don’t think so. I was in a similar situation with my preferred airline a few years ago. I was late getting to the airport due to weather and an accident on the highway. I arrived at the airport and spoke to a rep at check-in, as I had baggage that time, and they called down to the gate, told them I was on my way, then proceeded to expediate the security process. Since everything was in my checked baggage, the security check took no time at all; I was then directed to the gate, which I jogged to. The flight crew closed the door to the aircraft as I stepped on the plane. This didn’t delay our flight, as they had just finished boarding. I was more than impressed. By all rights, they could have left me at the gate. I know that for my story, there are hundreds of others both for and against each of these airlines. What gives the airlines the right take away our time and not compensate us when it’s their fault? I will do everything I can to avoid using this airline again. I’m tired of being treated so badly and don’t believe we should have to put up with it. I had the privilege to attend and present at a Lenovo build event last week. (I love my job). The group was mostly SMB IT consultants. I decided to talk to the group of them about Hyper-V and Server 2012 R2. Some of the group had used and implemented Server 2012, some had not, and a few had never seen Server 2012 and were still deploying Server 2008 R2. As it often happens when you get a bunch of IT folks in the room, we had a lively discussion about the current state of technology and what the attendees were currently implementing. I was pleasantly surprised to learn that the participants that were deploying 2012 and 2012 R2 were, for the most part, doing so in a virtualized environment. As we continued to chat, we started discussing how far SMB-specific IT has come. Only 18 months, or even a year ago, we wouldn’t have even considered implementing a virtualized environment in an SMB due to cost, implementation, and lack of understanding. For those of you who don’t know, we IT folk have been virtualizing in the Enterprise for years now. Typically Enterprise would use VMware as their virtualization platform. But since the release of Server 2012, not only has Enterprise looked at Hyper-V differently, SMBs have also started looking at virtualization. So what is virtualization? Virtualization is the ablitity to use one server to host several other operating systems on that same server. Typically, the cost to do this was prohibitive at the SMB level, and most IT consultants felt the practise was not necessary in the SMB space. Along with this, the SMB had a difficult time understanding the benefits of running multiple operating systems on a single server. Personally, I won contracts based on the fact that I was not going to virtualize the environment. That was 3-4 years ago. The last project I completed prior to leaving my company was to replace an aging 2003 server and replace it with a newer model; and guess what I put in: Server 2012 (R2 was not available at the time). I did this because I knew that as the company grew, they could take advantage of the virtualization if they chose to do so. This was one of those contracts I won because I was not going to virtualize. 1. Cost savings – you can reduce the number of physical servers on-site, which reduces your equipment, operating, and maintance costs. 2. Easy out-of-the-box disaster recovery – because the servers are virtual and essentially just a file; it’s much easier to backup, move, migrate, and recover. 3. Testing and development – you can easily spin up a virtual machine for testing and troubleshooting issues without the cost associated with a physical machine. And when you’re done, you can just delete it! As we march to the End of Support for Windows Server 2003, consider implementing Server 2012 R2 and taking of virtualiation that is included out of the box. If you would like to learn more about virtualization, I’ll be “Exploring Hyper-V” in the next Samurai Series webcast March 25, register here. If you have questions, talk to your trusted IT professional about how your small business can benefit in the virtual environment. 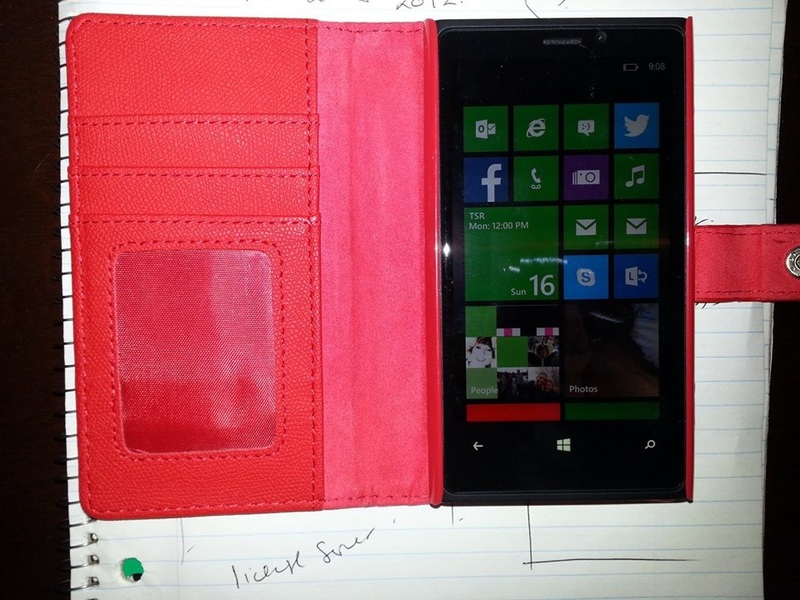 Today is my three-week anniversary with my new boyfriend, Nokia Windows Phone. I have to admit, it was hard for me to let go of Google S3, whom I dearly loved. If I stopped counting how many times I have almost physically lost control of Windows Phone, I think we’d be a pretty hot couple. But it took time for us to connect; it was a slow “awkward first date at the movies” type of relationship before we could truly become in sync on a deeper level. If you aren’t aware, I have had a serious love affair with Google for many years now. I’m not going to get into the tawdry details of this relationship; but if you want to know how I fell deeply in love with Gmail, and then why I considered leaving Google for someone a little bit more grown-up, see my blog post here. 1. I love the screen. For us mature ladies, it’s clear and easy to read. 2. The camera rocks. I even think it’s better than the camera in my S3. 3. Integration with the office. This is what pushed me to explore new relationships. I can do anything I need related to office communication with my phone. He’s as good as I dreamed it would be. 4. Easy to use. For the most part it was easy to setup and start using. It didn’t take long before I got familiar with the settings. 5. Car connectivity. This is hands-down the biggest bonus of Windows Phone. He seamlessly connects to my car; and even reads me my messages and plays the music I like. As my favourite daytime talk show host always says: you will never change another person. Bearing that in mind, I know I will either have to live with the following quirks or move on. 1. Lack of apps! I knew this was going to be an issue going into the relationship, but I didn’t realize how much I depend on those apps; and I’m not just talking about Angry Birds or Candy Crush, I’m talking maps, music, podcasts, time tracking, etc. This has been the biggest struggle for me by far. 2. The extra swipes to get to where I need to be. I think this is just something I need to get used to. The lack of “screens” bothers me. S3 had one screen for “work”, one for “games”, one for “kids”, one for “settings”, etc., and I could easily and quickly get to where I needed to be. With Windows Phone, it seems to require more effort to get to the same place. 3. Lack of notifications. S3 had a notification bar along the top that let me know all that was incoming. As far as I can tell, Windows Phone doesn’t have this feature, and I have to enter my password and actually glance at the screen to see where the indicators are. 4. Lack of app consistency. Again, this is a small thing, but it really bothers me. I keep my Facebook newsfeed pretty clean. No offense to some of my friends, but I block specific notifications requests, etc. to reduce the amount of stuff that comes across my feed. On my Dell Venue 8 Windows Pro, the Facebook app continues to follow those rules, but on my phone, I see everything. At this point I rarely check FB on Windows Phone because the feed is so full of clutter. My final thoughts… Yes, I’m going to stay with Windows Phone for the time being. I like the independence and I don’t feel like Gmail has complete control over my life. I’m not completely in love with my new phone, but there are warm and fuzzy feelings. He’s a good solid phone (quite literally), and reminds me very much of my Blackberry: down to earth, no nonsense, and dependable. At least Windows Phone is way sexier than my old Blackberry boyfriend will ever be – I even got a hot red case to show how committed I am to him. PS…if anyone knows how to sync music from my computer to the phone without plugging it in, please let me know. I know it’s been a while. I am really hating starting my posts with an apology because I’ve been absent, yet again. Since I have been working for Microsoft (via an agency, I have to put that in there for legal reasons) I have been busy. I’m not complaining but it’s been super busy and my “free” time is limited. Every time I learn something new or give a presentation I think “that should be a blog post and I’ll do it tonight” then 10 pm rolls around and I’m in bed fighting to stay awake. At the risk of sounding like a broken record, I’m really going to try to spend more time here. I love this space and the community around it. 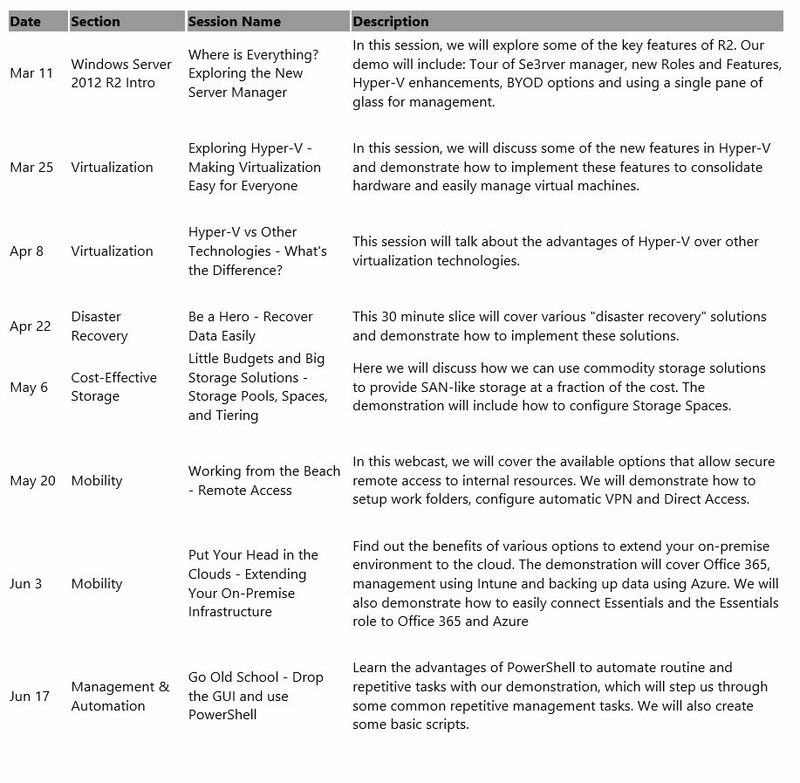 Feel free and join us for your slice of Server 2012 R2 and become the master of your 2012 R2 domain. For more details and registration follow this link. If you can’t make the live webcasts we will be making them available on demand.